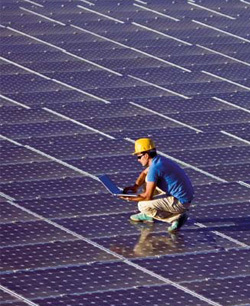 The maintaining of the Solar Power Plant is supportive to keep the same performance. The maintaing service of GO Enerji is the extensive maintaining service on international field. GO Energy proudly provides the most extensive maintaining of the world for Solar Power Plants. Thanks to its expertise and knowledge, it has very detailed applications to maintain productivity of the plants. With our own developed "33PointControl" application, the Solar Power Plants in use are controlled and analyzed up to the very finest detail. From solar panels to invertors, from cables to other electric elements or even to the details of the mechanic parts, the performance of all parts get analyzed. SPP, which have a very low need of maintaining compared to other energy technologies, are maintained to keep their performance and for intervention in urgent situations. GO Enerji gives a plus in service by increasing the performance and the life of the plant.